I painted this from a photo I took when my husband and I went hiking around Lake Minnewaska. Although the day was heavily overcast, the foliage was at peak, and the vistas along the carriage trails were a treat. 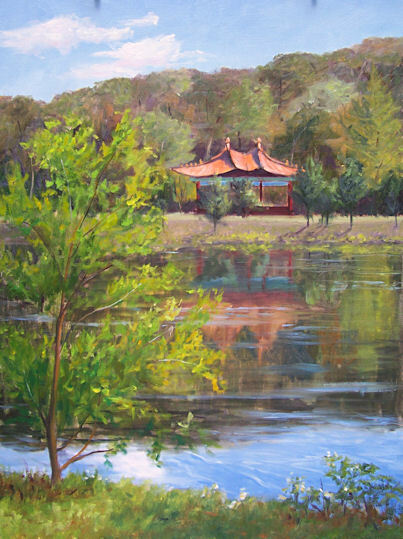 This painting was done mostly on location, with a few tweaks in the studio to finish it up. 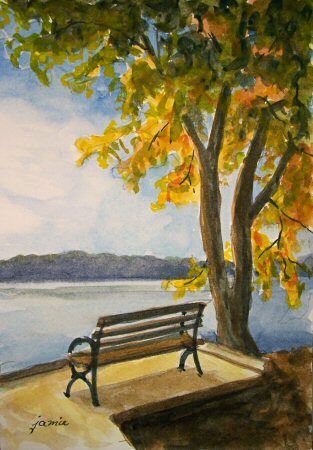 It is a scene from Long Dock (Beacon Point Park) along the Hudson River. I loved the rusty-orange trees against the distant blues of Mt. Beacon, and the brighter greens of the foliage that hadn’t yet realized fall had arrived. 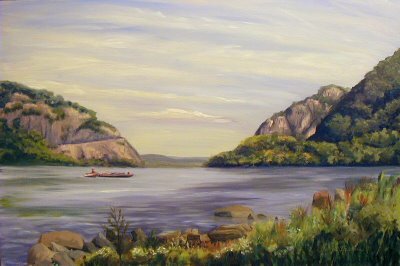 This large painting was done on location in Cold Spring, New York over a period of several days. It was pretty windy some of that time, and I thought the painting was going to act as a sail and carry off the entire easel from time to time! I was exhausted by the time the painting was completed, with the long days and long drives over to the location, but it was worth it. 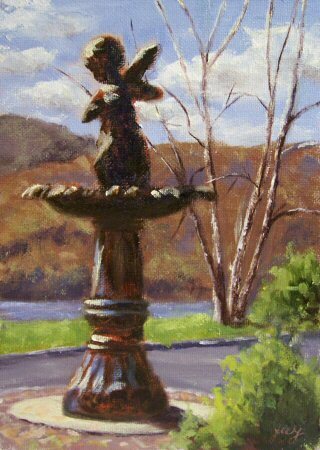 This painting was started a couple of weeks ago on a very chilly morning at the top of Kaaterskill Falls. It just needed a few minutes of studio touch-ups to call it done. 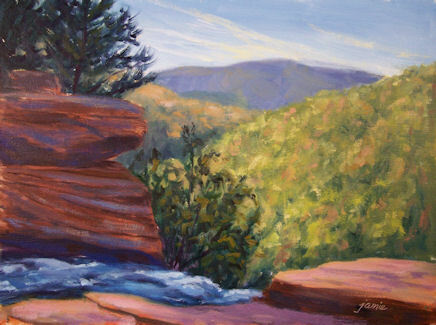 This is one of my favorite painting spots, and I go there often to paint the stunning cascades as they spill over the rocks before plunging down the 279 feet of Kaaterskill Falls. It is the tallest waterfall in New York State. This was a favorite spot of the Hudson River School painters as well. Back in those times, there was a dam up here to hold back the flow of water. A bucket would be lowered to the viewers below, who would each pay into the bucket for a water release to view the falls. Snack and drinks would also be lowered down to complete the attraction. My friend Claire came to visit a few weeks ago. 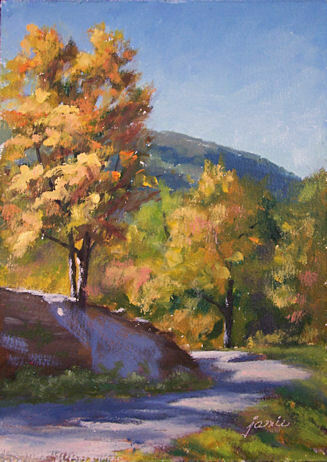 We both set up our easels in my driveway to catch the dramatic foliage against the cooler blue-greens of the mountain. The late day light was fleeting and the mosquitoes were fierce! I didn’t quite have time to finish on location, so I finished this up in the studio today. The leaves are already gone from that bright foreground tree on the top of the rock. Fall always passes so quickly! $960.00 plus $35 shipping and insurance within the Continental United States. For local sales, shipping charge will be allocated to NYS Sales Tax. Please email me at JamieWG@aol.com for International purchases or with any questions. 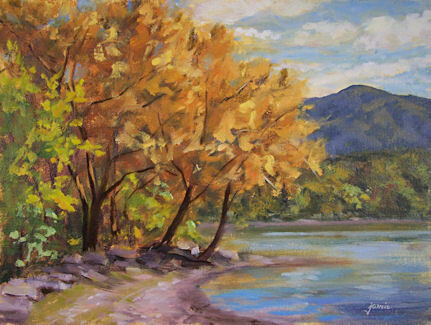 This is a fall plein air painting looking toward North Salem, across Peach Lake. 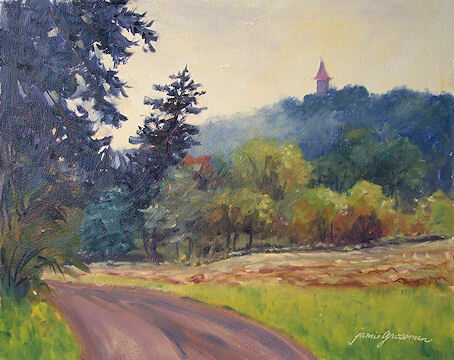 It’s quite large for a plein air painting at 20×24″, and took several sessions on location to complete. $160.00 plus $10 shipping and insurance within the Continental United States. For local sales, shipping charge will be allocated to NYS Sales Tax. Please email me at JamieWG@aol.com for International purchases or with any questions. 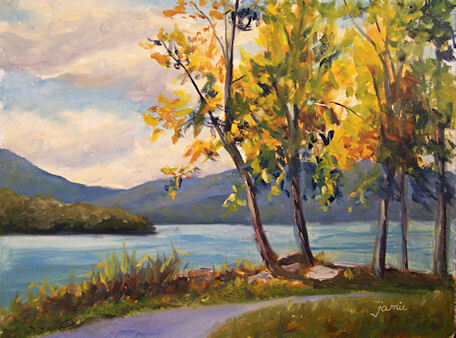 This is a painting that I started last fall at a great new park in Beacon called Long Dock. I went back today to finally finish it! Long Dock, or “Beacon Point Park”, is on a peninsula that juts out into the Hudson River. The sky was gorgeous, and the fall leaves here were in their peak of fall beauty. 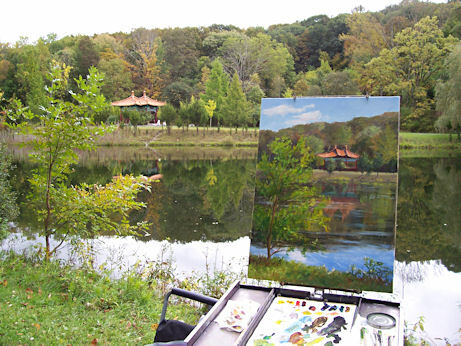 Sunday was the Olana Paintout, an annual event at the estate of the late Hudson River School painter Frederic Church. 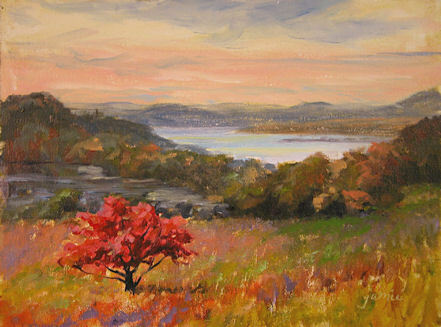 As I drove along the road that runs through the grounds to the top of the hill overlooking the Hudson, I was immediately captivated by this brilliant red tree standing alone out on the field. I pulled my car off the road and set up my easel on the spot. This was my first time painting since my hand surgery, and it sure was a challenge with a cast! 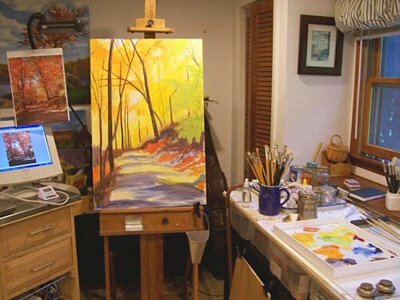 Every so often it’s good for viewers to see into our studios at what goes on behind the scenes in addition to painting. 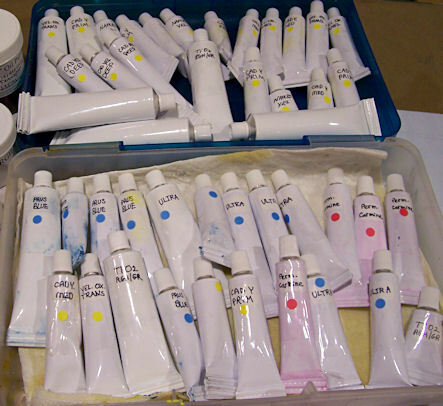 For the past few days, I’ve been spending some time getting oil paints from jars into these tubes. Many thanks to my friend Mary and daughter Sarah, who lent a helping hand (or two!) while my right hand recovers from surgery. Nine jars of various colors down, three to go! That translates to about another 12-14 tubes of paint. 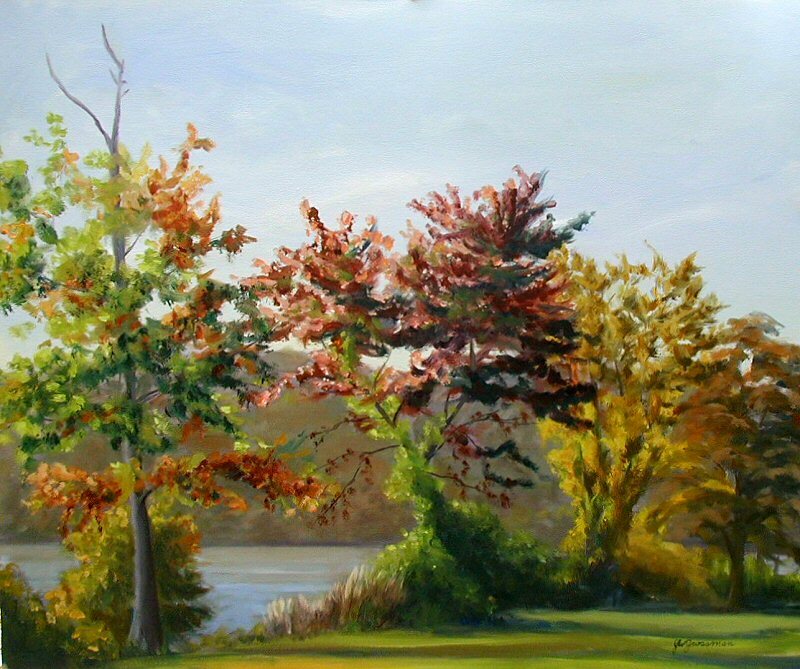 There’s quite a collection of wonderful objects, architectural treasures, and river overviews to paint at this favorite spot along the Hudson. I was drawn by the strong contrasts of light and shadow as the sun began it’s shift to the west, and the rusty undertones of the statue. There is nothing for a Hudson River painter quite like standing in the yard at Frederic Church’s estate and looking up at his home, paintbrush in hand. Spending an occasional day at Olana makes me appreciate the history and drama of painting in the Hudson Valley. 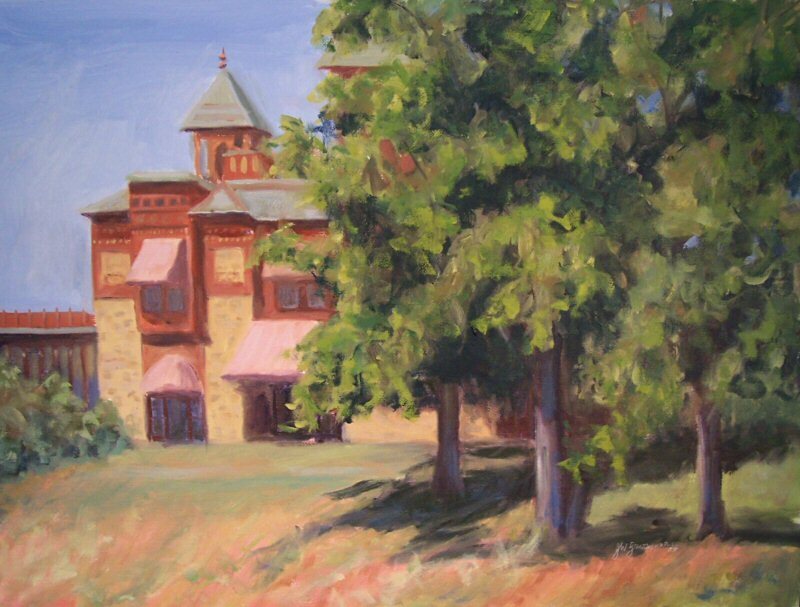 This painting, done on location at Olana, needed a few studio tweaks before I could call it done. As you can probably tell by looking at the painting, the drawing of the mansion took up most of my painting time on site! The sun was moving quickly and the lighting changed dramatically before I had a chance to wrap it up. In the studio, I touched up the trees a bit and altered the slope on the left side. Now it’s ready for a special wall—maybe yours? $3,500.00 plus $125 shipping and insurance within the Continental United States. For local sales, shipping charge will be allocated to NYS Sales Tax. Please email me at JamieWG@aol.com for International purchases or with any questions. 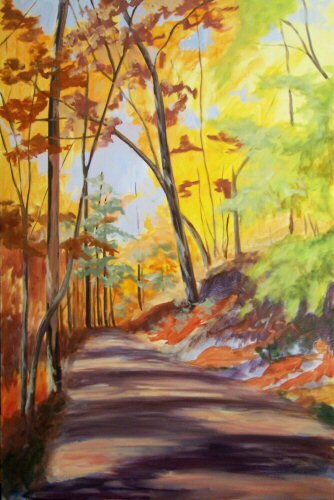 This large oil painting is a scene painted from a photo I took on Indian Hill Road in Garrison, New York. It is a mostly-unpaved road that leads down to Constitution Marsh. The fall foliage there is always the best anywhere! For those who like to see things in progress, below is an image of how things began. I worked off both a computer monitor and printed photo, and used them more or less as a springboard to create the painting. I washed the background with yellows to start. This would give the feeling of the light filtering through the fall leaves as I added more layers. 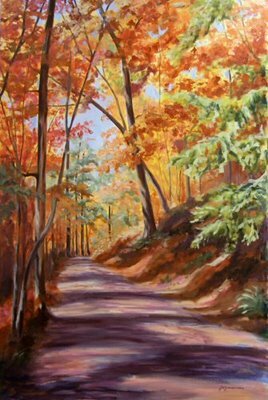 Once that yellow wash was on the canvas, I went right to the darkest darks and mapped out the painting in light and shadow. The image below gives you an idea of how I go about laying in the leaves and colors. 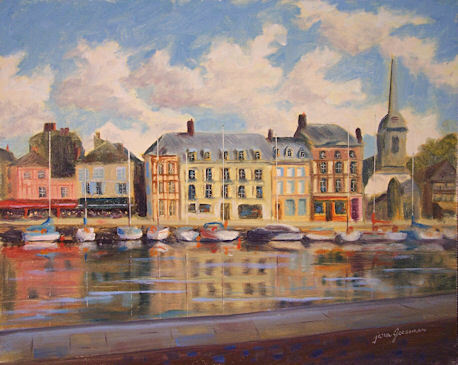 I had the best time painting this busy, colorful French scene! All those little windows and architectural trimmings, the boats, water, reflections, people sitting in the cafes…. Such fun! This was painted early yesterday morning for Artists on Location in Garrison, NY. 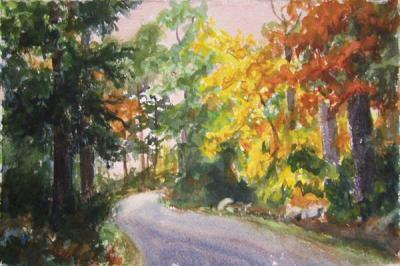 There was a misty drizzle on and off, so I found a spot off to the side of the dirt road where I could paint in my car! Each time it started drizzling, I’d take my pochade box into the car, only to re-emerge as the precipitation paused. When I was nearly done, the police asked me to move because they were afraid I was going to get run over! I moved over to that field on the right to finish the painting. I’d really like to go back there soon to do a larger version of this painting. If anybody wants to commission it, please email me! This one is sold. $135.00 plus $10 shipping and insurance within the Continental United States. For local sales, shipping charge will be allocated to NYS Sales Tax. Please email me at JamieWG@aol.com for International purchases or with any questions. Although there were heavy clouds overhead today, I spent another day on location with this painting to finish it up. It is such a beautiful and tranquil spot. I was entertained by a little grebe in the pond, some friendly passers-by, and a friendly chipmunk! I’d like to go back in a couple of weeks when the foliage is further along and do another painting….maybe an even larger one next time!